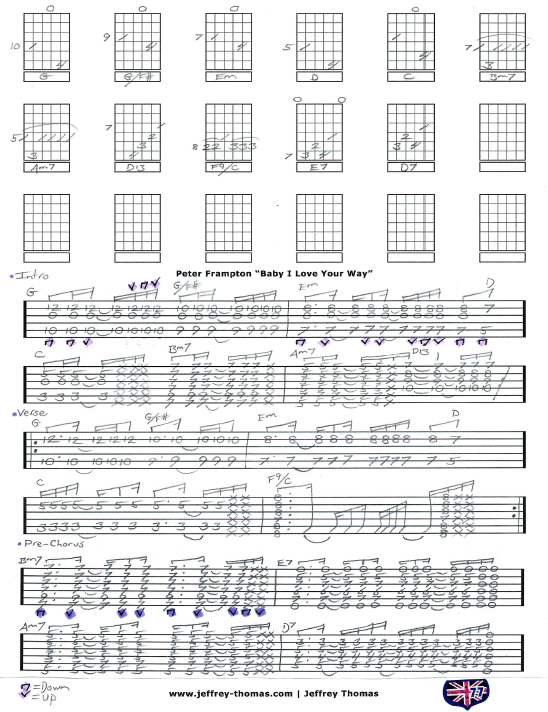 Peter Frampton Baby I Love Your Way Free Guitar Tab by Jeffrey Thomas. Learn to play this classic 70’s pop tune with my free guitar tab arrangement. I tried to get all the great signature strumming patterns, chords and song structure on paper for you. This song has some 16th note strumming patterns and barre chords so that puts it in the intermediate category. Want the full guitar tab for free? Just send in your email address using the form provided. Looking for online guitar lessons? Fill out the Schedule A Free Lesson form to set up your free Skype guitar lesson today. “Baby I Love Your Way” was a huge hit for Peter Frampton in 1975 reaching number 12 on the U.S. Hot 100 charts and number 3 on Canadian charts. Find more great free online guitar tabs on my blog, video and tab pages. Share This Guitar Tab, Choose Your Platform!